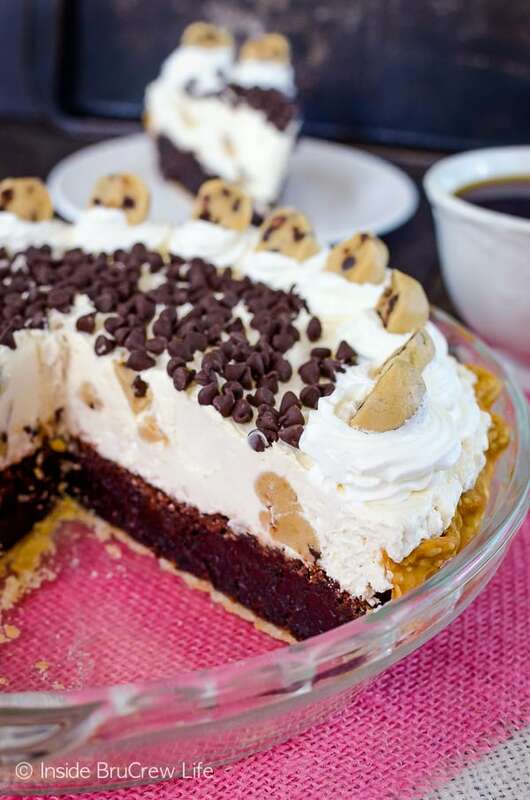 The layers in this Cookie Dough Cheesecake Brownie Pie will have you drooling in no time at all. Grab a fork and dive into the fudgy brownie, creamy cheesecake, and no bake cookie dough right away. *Sign up for my email newsletter to receive these delicious recipes in your inbox each time I share them. Oh, my word! You guys!!! 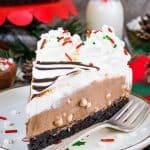 This is the most amazing, most delicious, most crazy good pie!!! Seriously!!! It beats everything I have ever made! Brownie cheesecake pie has kind of become my thing to make. You aren’t surprised, are you? 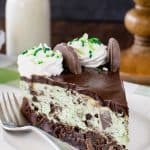 I mean after this Andes Mint Cheesecake Brownie Pie and this Peanut Butter Snickers Cheesecake Brownie Pie, you had to know another one was coming soon, right? 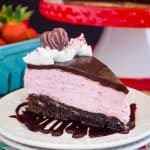 There is something about that ooey, gooey, fudgy brownie topped with a creamy no bake cheesecake that makes me go weak in the knees. I can’t stop making them…or eating them. My pants kind of hate me for that lack of self control around these types of desserts. It has been a while since the last brownie pie, so I started brainstorming some new crazy creations that would work with a basic brownie pie. I was also thinking up some new no bake cookie dough treats to try out when all of a sudden a lightbulb went off!!! Why not marry the two together? Seriously this was the best idea ever! 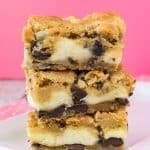 In fact, it was so good and got so many rave reviews that I included this Cookie Dough Cheesecake Brownie Pie in my cookbook Cheesecake Love. The brownie gets baked in a pie crust first. Now if you are a domestic queen and love making your own pie crusts, go for it. It totally will work. But this pie has quite a few layers and steps, so I went with a refrigerated pie crust just to save time. Anything that saves me time in the kitchen is my friend. It just means I am one step closer to face planting in pie goodness. One more confession. I also used a boxed brownie mix. My reason…see above. Feel free to experiment and make your own, but your baking times will probably be a little different. The key to this pie is to NOT follow the box directions. You want your brownie layer to be rich and fudgy, so make sure you only add the following ingredients to the 9×13 dry brownie mix. The mixture will be very thick and sticky. Spread it out evenly in the bottom of the pie crust and bake for 40-45 minutes. Remove and cool. While the brownie layer bakes, get started on your cookie dough pieces. There is no egg in this cookie dough, so it is safe to eat without cooking. I may have been sampling the dough as I rolled the tiny balls. One for the pan, one for me. Reason #2 in this post of why my pants are angry with me. Mix together butter, brown sugar, vanilla, salt, and a splash of milk until creamy. Slowly beat in the flour. Feel free to microwave the flour for a minute before stirring it in. 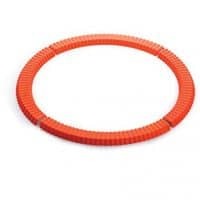 This eliminates any contamination that could be present in raw flour. Stir in the mini chocolate chips. Roll the dough into 56 small cookie dough bites. You want to make sure to roll them small, so that there is enough to spread them out evenly in the cheesecake filling. Place the cookie dough balls on a wax paper lined tray and place the pan in the freezer. Leave them there until later. Beat together cream cheese, vanilla, and brown sugar until light and creamy. Fold in a container of thawed Cool Whip to create a light fluffy filling that compliments the dark, rich brownie pie so well. If you are opposed to the creamy white stuff, you can definitely make a sweetened homemade whipped cream to use in place of it. Take the cookie dough bites out of the freezer and cut them in half. Make sure to set aside 10 balls (20 halves) for the topping. Gently stir the rest of the cookie dough bites into the cheesecake filling, then spoon the filling on top of the cooled brownie. Pipe Cool Whip swirls around the edge of the pie. 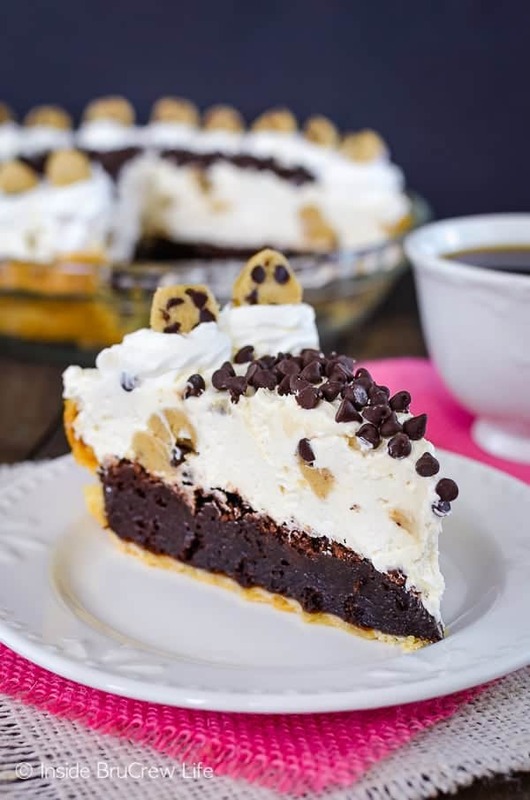 Sprinkle mini chocolate chips in the center of the pie. 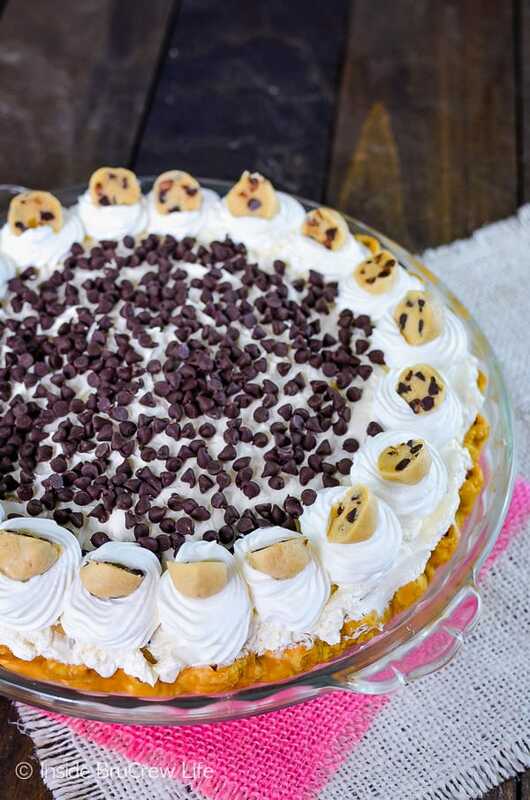 Place the remaining cookie dough pieces on the Cool Whip swirls. Now get ready to face plant! Seriously! It is that amazing! Unroll the pie crust according to the package directions. 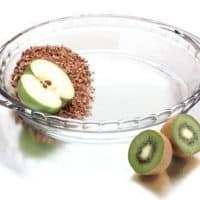 Place in a 9 1/2-inch deep dish pie plate and set aside. Beat the brownie mix, oil, water, and egg until combined. Spoon into the pie crust. Cover the edges of the pie crust with foil to prevent them from burning. Bake for 40-45 minutes. Do not over bake. Remove from the oven and cool completely. Beat the butter, brown sugar, vanilla, and salt until creamy. Add the flour and milk and beat again. Stir in 1/4 cup of the mini chocolate chips. Roll into 56 tiny cookie dough bites. Place on a wax paper lined tray and freeze until hard. Beat the cream cheese, brown sugar, and vanilla until creamy. Fold in 3 cups of Cool Whip. Stir gently into the cheesecake filling. Spoon the filling gently on top of the cooled brownie. Use a piping bag and icing tip 1M to swirl Cool Whip around the edge of the pie. Use the remaining cookie dough bites to decorate the swirls. 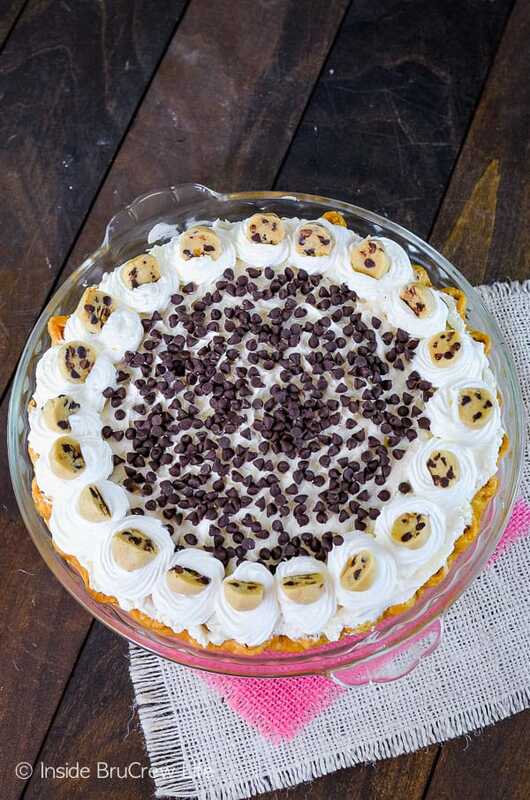 Sprinkle the center of the pie with the remaining chocolate chips. 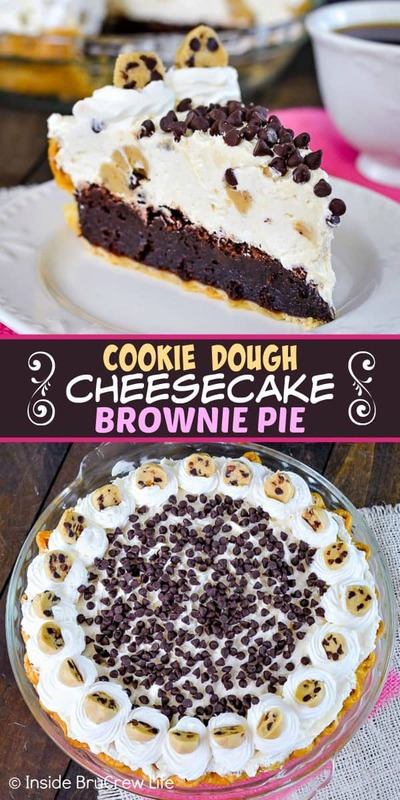 *This Cookie Dough Cheesecake Brownie Pie recipe was originally published on July 8, 2014. 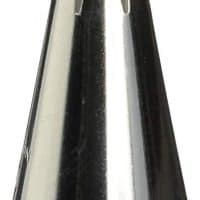 The photos and post have been updated and republished on January 15, 2019. WOW!! pinned I need to make this – when there are lots of people around – so I dont eat it all. Oh my word is right – this pie is beyond incredible. I love recipes that knock my socks off! 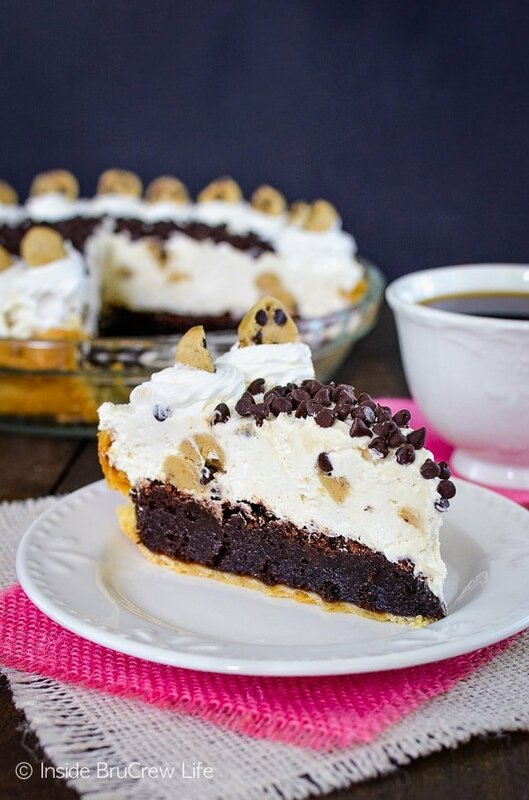 Cookie Dough Cheesecake Brownie Pie – Yes, yes, yes, and yes! This is insane. What a combo! I wish I had a piece for breakfast right now. Seriously though, brownies, cookie dough, AND pie!? Amazing. That just sounds like a little piece of heaven! Wow! As always, looks delicious, Jocelyn! Wowie. I don’t usually play favorites, but yeah, changing that rule right about now! Yowza! Now that’s dessert. This sure is the most amazing. Holy cow woman!! Best pie ever. It almost looks too pretty to eat! Yum! It truly looks sinful. What an AMAZING combination, Jocelyn! 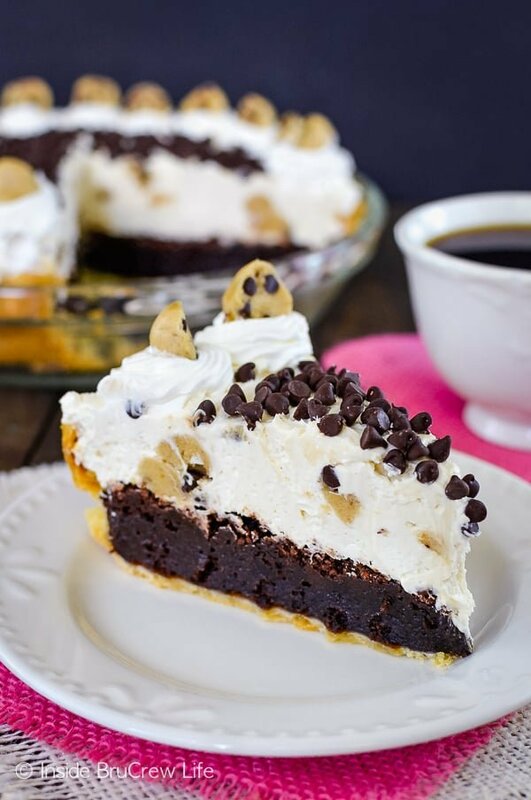 This looks like the most decadent pie ever…love everything about this! Pinned! SHUT THE FRONT, BACK & SIDE DOOR! Brownie, cheesecake and cookie dough this is over the top freaking amazingness and I want to shove my face all up in it. Bravo sista, looks to die! Holy wow, this pie sounds all kinds of amazing lady! 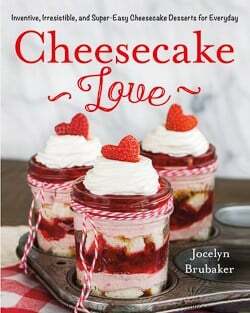 I love everything in here and want to face plant into all the brownie, cheesecake and cookie dough layers! 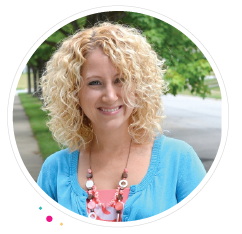 Love and pinning! This is just a smorgasbord of awesomeness. The brownie, the cheesecake, the cookie dough, I can;t decide what I like the best! Too funny! 😉 Thanks Serene! I am thinking I am going to need a piece of this pie! Maybe two! You and your pies, you’re killing me!! This may be my favorite one yet!!! Umm…yes please! This looks flippin fantastic! This is one incredible pie! Actually, all of your brownie pies are! This is seriously AMAZINGGGGG. I died. Giiiirl, you are over the top! I love it. We’re having a barbecue this weekend, and this might just be dessert! OH. MY. I about fell over when I saw this on Pinterest – talk about decadence at it’s finest! I can’t even. This is the stuff my dessert dreams are made of! Absolutely a stunner! This is an amazing pie! Love the little cookie dough bits around the edges, so cute! Good gracious! This looks amazing! I am a HUGE cookie dough lover and this needs to get in my belly! Nice job, Jocelyn! OMG, all of my favorite things collided into one dessert… ahhh, this goes sstraight to the top of my MUST MAKE list!!! love the pic of the closeup so you can see the cookie dough sliced through. Oh my gosh this looks to die for! Cookie dough is one of my all time favorite things! My birthday is coming p this weekend. Might be the first year ever I make a pie instead of cake! Do it!!! 😉 Thanks Krystle! This is the prettiest most scrumptious looking cookie dough pie! I love this. Oh.My.Word. Cue the applause now. My family will love me forever when I make this! Girl!! This pie looks simply dangerous! LOVE IT! Pinned! i don’t think i’ve seen a brownie pie before. this looks out of this world good! Not only is this a gorgeous pie but I’m gonna make it for my face too! CANNOT WAIT! This is a PMS’ing girls dream come true! looks great! wondering how you think it would turn out if i substituted the brownie out for even more cookie? or maybe a combo of the two?? Do you mean a cookie crust instead of the brownie base? I’m thinking that could be pretty tasty 🙂 You have me thinking of some new versions now!!! I’m making this right now and the brownie isn’t baking well. It’s been in for about an hour now and it’s still liquidy. What’s going on? Hi, Regina. Did you add the ingredients from the back of the box or just what I had in the recipe under the brownie mix? I have never baked a brownie pie more than 45 minutes. Brownies do look undone when they come out of the oven, but as they cool they set up. I mixed it the way you had said to. Not what was on the box. Also, the cookie dough never hardened. I’m not sure what to tell you 🙁 I have honestly made this quite a few times and it has turned out every time. What do you mean the cookie dough never hardened? You should have been able to roll it into balls, but it will be soft like cookie dough. I froze the ones that went on the top just so I could cut them easier for decorations. Oh my this looks heavenly! Can you make it again and just ship it to me? Haha! LOVE this cheesecake. it’s one of our family’s favorite desserts! Just wrap up the whole pie for me, I’m ready! 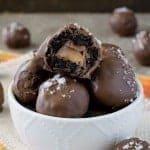 I need to make this for my family, what a treat! 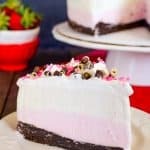 I love that it’s no bake too!